WILLEMSTAD - Gert Rip needs to get lost. This is according to Elmer Wilsoe of the Pueblo Soberano party. The former Minister of Justice reacts to statements of the Public Prosecutor during the pretrial session in the appeal of Burney 'Nini' Fonseca last week. In it, Prosecutor Rip said that Wilsoe and also former minister George Jamaloodin are relevant in the Fonseca case. 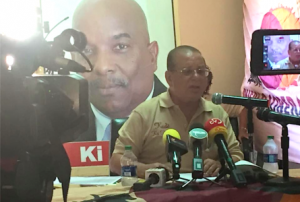 According to Rip, Wilsoe has informed the perpetrators of the Helmin Wiels murder by telephone about the location of Wiels at playa Marie Pampun. There, his party partner was killed on May 5, 2013. Wilsoe denies any involvement and thinks Gert Rip has to come up with proof or otherwise get lost.